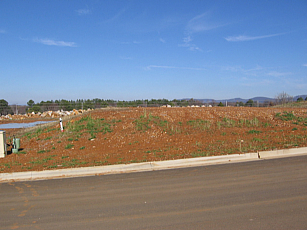 Site preparation includes everything you need to do to get the lot ready to build on. That includes clearing of trees, rocks, underbrush, anything that may be in the way of your foundation. Ditches or depressions may need to be filled, or high spots leveled. 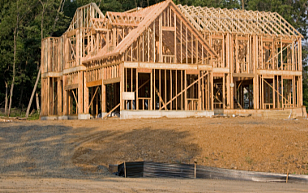 The best way to determine what is needed is to consult with a foundation contractor. Make sure that you contract to haul away whatever you are clearing. That may require a separate contractor that specializes in hauling. Don’t just let them push it to the side unless it is topsoil or subsoil, free of debris, that can be used later for fill or rough-grading. A “pad” is a raised area of ground that has been compacted (by weight of bulldozer) and is ready to receive the foundation. Most pads are built from fill dirt hauled to the job site. If you are building a slab foundation, you will need to have a pad built unless the lot is already fairly level, which is true of many subdivisions. This photo shows a level pad built on sloped land. Remember to have compaction test performed on the completed pad.